Busloads of opponents converged Thursday on the state Capitol for a public hearing on a bill that would penalize so-called "sanctuary cities" in Wisconsin. 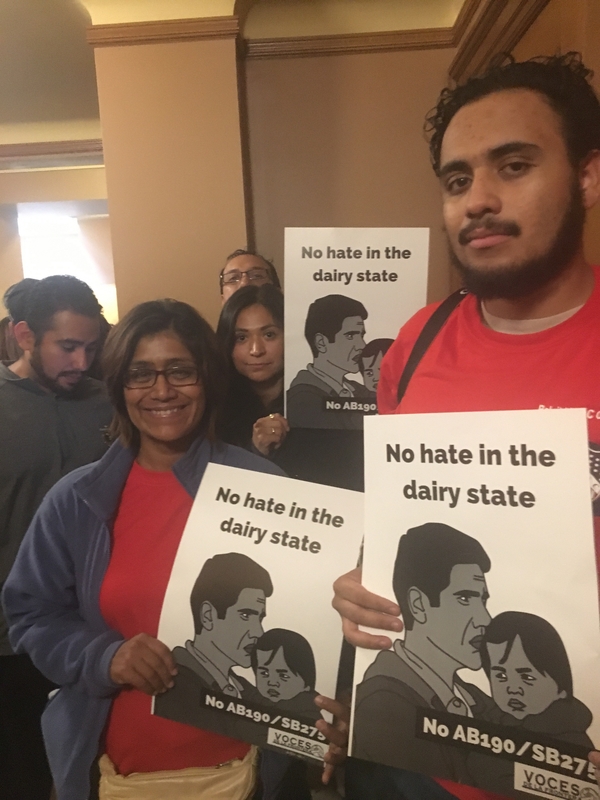 Immigrant groups and other opponents arrived in Madison from across the state, filling a Capitol hearing room, and spilling into hallways and an overflow space to watch a live feed of the proceedings. The proposal up for consideration would impose fines of $500 to $5,000 per day for communities that have passed rules barring law enforcement from asking people their immigration status or reporting people living in the country illegally to the federal government. Supporters of the proposal argue it is "common sense,"  and will promote safety in communities. "These politically correct policies actually increase the risk to public safety in order to make a political statement regarding federal immigration laws," said Sen. Steve Nass, R-Whitewater, one of the bill’s sponsors. "Each local municipality cannot pick and choose which state and federal laws to obey or ignore. Otherwise, we no longer have a government of laws." Opponents to the bill  include the City of Milwaukee, Wisconsin Farmers Union, and immigrant advocacy group Voces de la Frontera. Christine Neumann-Ortiz, executive director of Voces de la Frontera, said hundreds of opponents came to the Capitol to speak against the bill because they recognize the high stakes. "Why? Because they've lived through a period of deportations, of family separation, of increased discrimination, and they know this is not theory," Neumann-Ortiz said. "They know the reality." Darryl Morin, representative of the League of United Latin American Citizens, testified  the bill would "send a message of fear and division and would have a chilling effect on police-community relations." The bill has yet to receive a vote in a Senate or Assembly committee. Editor's Note: This story was updated with additional reporting from WPR at 3:48 p.m. Thursday, October 12, 2017.